The Liberal Democrat leader Nick Clegg will attempt to quell a growing sense of mutiny in party ranks over his plans to cut spending and raise taxes. In his closing speech to the Lib Dem conference in Bournemouth, Mr Clegg will concentrate his fire on the Tories in an attempt to appeal over the heads of delegates to disenchanted Labour voters. But he will have to watch his back with senior colleagues voicing concerns over the electoral effects of levying a "mansion tax" on properties worth more than £1m. The Lib Dem leader has faced mounting criticism from delegates of his decision to drop some of the party's flagship policies, including the promise to abolish university tuition fees. One senior Lib Dem MP even suggested Mr Clegg still has to prove himself as leader. 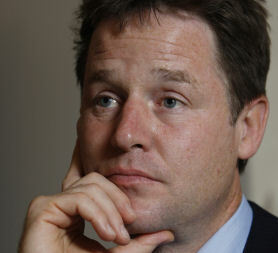 Mr Clegg will use his speech to say the "Liberal Democrats will do things differently in Britain". He is expected to say: "If you want tax cuts for ordinary people, paid for by closing loopholes for the very rich. If you want the right to sack your MP if they’re proved corrupt. If you want children to get personal attention when they start out at school in classes of just 15. Then vote for it." He will also use the opportunity to urge those who previously voted for Labour to chose his party. "You can give away your vote to a fringe party. You can stay at home in despair.Or you can join with the Liberal Democrats and make the difference," he will say, while also dismissing the "fake change" offered by the Conservative party. Mr Clegg has angered many within his party with warnings this week that they need to be "realistic" about what can be afforded given the dire state of the public finances. He has appeared to acknowledge having gone too far by suggesting "savage" cuts were needed, however, dropping the word since it was picked up by the media at the weekend. Senior Lib Dem MP Evan Harris used an address to the conference hall to state Mr Clegg had not yet proved himself as a "great" leader. "I think Nick is a really great guy and a good leader," he said. "But good Liberal Democrat leaders only become great leaders, as they all do, when they recognise it's the party that makes the policy. "It makes the manifesto from that policy. And I expect Nick will soon be recognised as a great leader." In a barely-veiled critique of Mr Clegg's strategy this week, work and pensions spokesman Steve Webb said: "I think we have overdone the despair." He added that the party would not win votes by being "too much hair-shirt" and bluntly opposed a move to means-test child tax credits - as suggested by Mr Clegg. Lib Dem environment spokesman Martin Horwood became the latest MP to cross Mr Clegg over tuition fees, insisting the policy to scrap them should be made "stronger and clearer". His comments were loudly applauded by delegates in the conference hall. Charles Kennedy, the popular former leader, has also raised concerns about the move.